Affordable Alley Lot Cottage House! Description: Affordable Alley Lot Cottage House! Lots of privacy for a couple or small family. The alley lot is fully fenced front and back. Fantastic location just a few blocks to walk to Lodi Lake near Turner Road and also the central downtown area of Lodi. 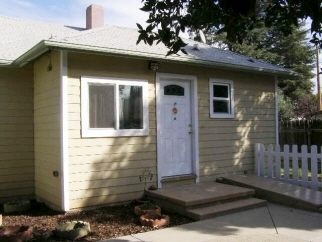 The small 684 Sqft, 2-bdrm 1-bth home is very cute and clean. Upgrades include custom kitchen cabinets with Aztec Granite, dishwasher and disposal. New A/C - Heat, new plumbing, new electrical and a completely all redone ceramic tile bathroom with a Jacuzzi tub. Lots of storage in 1-car detached garage and basement. Yards are easy maintenance, comfortable and with a dog run. Please take a drive along the wide Forrest Ave alley between California St and Lincoln Ave. Gladly shown by appointment!